Mercer County is is named for Continental Army General Hugh Mercer, who died at the Battle of Princeton in 1777. 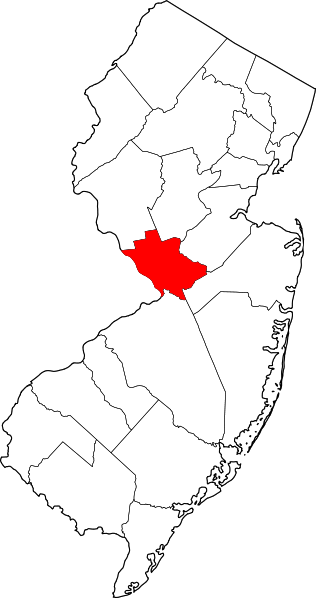 Mercer County is governed by a seven-member Board of Chosen Freeholders. The Freeholders are the center of the legislative and administrative resonsibility in Mercer County. The Mountain has over 12 miles of marked natural trails for hiking and horse back riding. There are trails for all abilities from short level loops to steep rocky trails. Nestled in the heart of the Pleasant Valley Rural Historic District, this 130-acre park was a working farm for over 240 years when its last private owner, Inez Howe Howell, gave it to Mercer County in 1974. The Park Commission is restoring the farm to look and operate the way it did a century ago -- a time when most of Mercer County was still rural and when farmers worked by hand and horse power to make the land productive. In keeping with Mrs. Howell's wishes, the Park Commission offers year-around programs that allow visitors of all ages to join in the work and fun of life on a farm. This completely wooded park, with its mature trees and gently rolling contour, is among the best in the area for a moderate hiking adventure. This park provides an ideal setting for street fairs, small concerts and art fairs and is a favorite lunch stop for area business offices. Mercer County Park encompasses over 2,500 acres covering areas of the Townships of West Windsor, Hamilton and Lawrence. The Park has year-round facilities for all ages and includes both active and passive recreational opportunities. The Mercer Meadows facilities and opportunities are extremely passive and involve natural trails, viewing areas, and limited amenities. Areas include: walking, bike and horse trails, scenic nature photography areas, cross country skiing trail, environmental education areas, current farm land, fishing in designated areas, and acres and acres of wildlife observation. 257 acre natural park in an urban setting that has a fresh water marsh connected to the tidal portion of the Delaware River and a spring-fed lake, appropriate named Spring Lake. The park is located within the Trenton-Hamilton Marsh. Rosedale Park encompasses 472 acres and includes a 38-acre lake stocked with trout. This is a very popular location on the opening day of the trout season. The Park features two playgrounds for children to enjoy. The family picnic area is situated alongside the lake and has over one dozen public picnic tables and charcoal girls. This is a first come-first served area open to the public seven days a week. Boating and canoeing are allowed on the lake; however, gasoline engines are prohibited. Electric engines are allowed on the lake. A larger, reservation only, picnic area which includes a playground, grilling areas, basketball and softball can be reserved through the Recreation and Events office. Waterfront Park is located in the capital city of Trenton and is home to the Trenton Thunder, currently the Double-A affiliate of the New York Yankees.